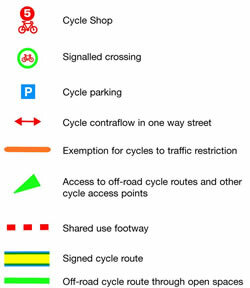 The specification for the Cheltenham Cycle Map is being considered as the basis for a national standard. If you have an interest in producing a similar map for another town, please contact us. We will give advice and guidance for free and may also be able to offer consultancy services to help in producing your map. The Cheltenham Cycle Map was the first of a new style of cycle map to be published in the UK. Similar maps have since been published for Gloucester and Kettering with others under consideration. Instead of showing only specific cycle routes and other facilities, the map categorises the entire highway network according to the degree of skill and experience needed for cycling. This classification is linked to levels of cycling competence prescribed by the National Cycle Training Standard. All roads (other than where cycling is legally prohibited) are cycle routes, but the amount of skill needed for using them varies according to traffic volume and speed and the complexity of road design. Whilst inexperienced cyclists will not be competent to use more difficult roads, almost all roads are capable of being used safely by cyclists that can attain the Level III National Cycle Training Standard. The map should have the widest audience and provide information useful to cyclists of all abilities. However, not all of the information will be relevant to all cyclists. By providing 'higher level' information, less able cyclists may be inspired to extend their horizons by becoming more skilled. Whilst designated cycle routes and other facilities are clearly shown, they should not dominate the map. Facilities of low standard, particularly where there are safety concerns, should generally be omitted. The map as a whole should provide a 'do-it-yourself' tool to enable any individual, irrespective of their ability, to work out the route that is best for them between any two places. No network of designated cycle routes can ever provide such a comprehensive asset for all cyclists. Quiet roads with little traffic and low traffic speeds. Generally suitable for all cyclists. These are mostly non-distributor residential streets or roads through parks. Through routes with moderate traffic and low speeds. Suitable for Level II and Level III cyclists; perhaps Level I at less busy times. Shopping streets and industrial premises should be classified green as minimum due to the complexity of the traffic environment. Busy roads, including A or B roads, where road design is traditional and does not lead to excessive speed. Few HGVs. Road width allows safe overtaking of cyclists over the greater part of its length. Suitable only for Level II and Level III cyclists. Busy principal roads, perhaps with some HGVs. Road width restricted, leading to increased risk from overtaking vehicles. Traffic speed high relative to road width with drivers less willing to cede right of way to cyclists. Complex junctions. Suitable for Level III cyclists and some Level II. Fast, busy roads with frequent HGVs. Motor vehicle-orientated road design, such as use of slip roads, large roundabouts. Restricted lane width. Suitable only for Level III cyclists. The standard provides for the depiction of steep hills by an arrow pointing downhill (similar to that used by Ordnance Survey). These are depicted by the use of blue road edging. These are shown as a solid green line of width similar to minor roads. Access points are indicated where routes are grade-separated from roads. A symbol is used to indicate signal installations with a cycle phase to take a cycle route across a road. These can include road closures with retained access for cyclists and exempt turns. A lateral orange line is used to show that cyclists may cross (perhaps only in one direction) but general traffic cannot. If cycling is legally permitted, the streets are shown green as for ordinary roads where pedestrian volumes are high. If cycling is only permitted at certain times, a striped colour is used based on the experience required for cycling at those times. If cycles can use otherwise one-way streets in both directions (through the incorporation of a contra-flow cycle lane or by an exemption to a 'plug' at one end), this is shown by a double-ended arrow. These are shown only when the standard of implementation and maintenance is such that they do not significantly increase risk for those cyclists most likely to use them (Level I and some Level II). A broken red line is used. These are shown with a solid red line only if implemented and maintained to a high standard (minimum width 3m). Lower standard tracks (but not so low as to be unduly hazardous) are shown with a broken red line. 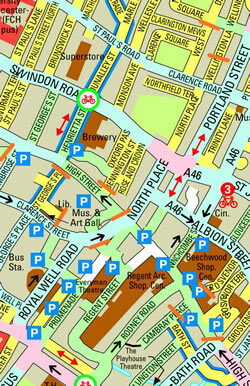 All locations with good standard cycle parking facilities are shown. Each symbol may indicate a cluster of parking stands. The locations of shops are shown by a numbered symbol cross-referencing a list of cycle shops on the map reverse. These are not depicted on the map but are taken into account in the classification of the roads on which they are present. Because narrow cycle lanes typically result in cyclists being overtaken closer and faster, with extra care needed when making most manoeuvres, these should generally result in a road being classified as requiring more experience than would otherwise be the case.